Known for their lush, full-bodied, and athletic movement, Michele Miller and Alana O Rogers are teaming up this weekend to produce an unprecedented evening spanning two generations of Seattle dance. The two choreographers will present a mixed bill of five works on October 10-12, at Velocity Dance Center. Michele Miller/Catapult Dance will show What We Have (2013), Threshold (2014), and I AM the Bully (premiere); while Rogers re-sets SIGHT (2013) and premieres her latest work, REWIND. Rogers shared her insights about this ambitious project with SeattleDances. SeattleDances: Tell us about the title, modus operandi? How did you settle on it and how does the meaning relate to the show as a whole? Rogers: We were playing around with titles that utilized our last name initials, M for Miller and O for O’Farrell. After many ideas playing with M.O., Michele said What’s your M.O.? We talked about the meaning behind the term modus operandi and it seemed perfect. Modus operandi is Latin for “a particular way or method of doing something, especially one that is characteristic.” In short it means “mode of operation.” It was perfect because we knew we wanted to produce a show our way with dance that was true to our choreographic identities. On a side note, the term is more often used in crime nomenclature to describe the signature style/methods of a criminal. That’s where most people have heard it. SeattleDances: Two choreographers are presenting work: yourself and Michele Miller. What has the collaboration process been like? Are there thematic commonalities between the two pieces? Rogers: It’s been a great process! Michele and I met through Cornish over 14 years ago. In the last two or three years, we’ve been in festivals side by side and last year she approached me with the idea of producing our own bill. I jumped at the opportunity. She’s kind of a goddess in Seattle dance—I wasn’t going to turn that down! There are no common themes between the pieces but we think our partnership is a strong one because we both create work that is heavily movement-driven, very physical, and emotive. We both like to deal with themes around human nature and dynamics between people. It’s also a really cool partnership, in my opinion, because Michele and I each represent different generations of modern dance in Seattle, spanning almost 20 years. This is fairly unique. SeattleDances:What has your creation process been like? What inspired you? Rogers: I’ve been working around themes of identity over the last three years, so my newest piece, REWIND, is my third, and probably last piece to deal with that theme. I worked in a skilled nursing facility last fall for three months as a physical therapist and had the opportunity to work with several patients with memory impairment due to dementia and neurological conditions such as stroke. It was immensely humbling and really affected me. While my past pieces, ID and SIGHT, were really on fairly youthful perspectives on identity, REWIND is about what happens when figuring out who you are is no longer a choice. What happens when all of your constructs about self literally disintegrate? My grandmother had Alzheimer’s so the experience felt very personal and added all kinds of questions for me about what my wishes would be if it happened to me or someone close to me. I read a few of books on the subject to prepare for the piece and also got to interview my father about my grandmother’s experience which was very enriching creatively. This is also the first piece where I’ve ever experimented with props and I have an entire a side story occurring on the periphery of the stage throughout the piece. SeattleDances: SIGHT was presented in Velocity’s NextFest NW 2013. Can you tell me a little bit about the piece, which will also be presented in modus operandi? Rogers: I joke that SIGHT is a bit of a problem child because it has full body paint and very intricate hair, which, all told, take about 30 minutes to apply per person, along with blindfolds—so it’s pretty challenging from a technical standpoint. Also, two of the dancers have to remove the body paint mid-show, so it’ll be a madhouse backstage with washcloths and buckets since there are no showers at Velocity. I can’t wait! SeattleDances: How has producing your own work informed this process? Rogers: I think producing our own work has been phenomenally freeing. In the festival setting, you still have a lot of individual choices, but there are even more here. There are also fewer limitations, especially technically. In some ways this makes the process easier, but in other ways, it’s much harder because you’re in charge of so much. Michele and I have been producing work for a long time though, but everything felt smoother once the fundraising and earlier administrative tasks were complete. I’m definitely in my happy place as we get closer to theater-time where we have a great team—Meg Fox for lights and Ilvs Strauss as tech director. I think this show has also been a nice boost to inspire me to present an evening of my own and I’m looking forward to going deeper with a single piece. SeattleDances: What else do viewers need to know before seeing this production? Rogers: Come with a willingness to take an extra stretching break! Also, don’t come on an empty stomach or I might make you hungry! More information about the Alana O Rogers Dance Company can be found at alanaorogers.org. For more info about Michele Miller/Catapult Dance, see their facebook page. 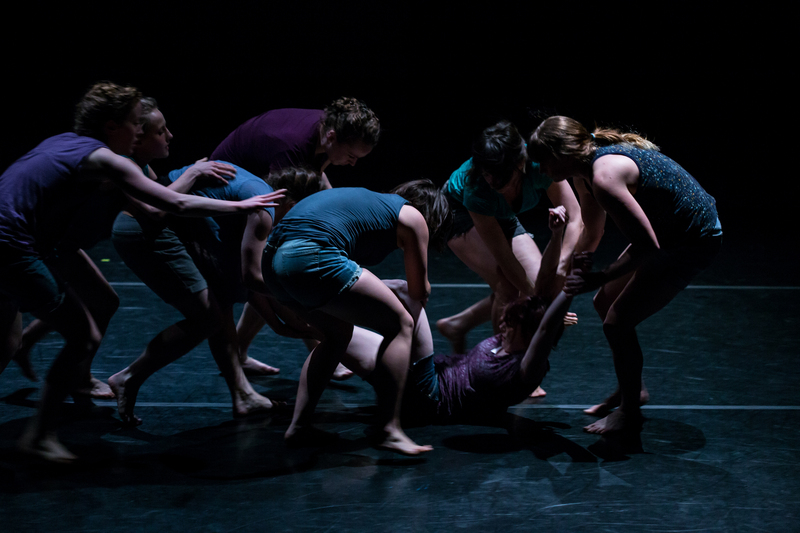 modus operandi runs October 10-12, 2014 at Velocity Dance Center. Tickets are available here. The Saturday, October 11 performance will be followed by an informal question and answer session.